You may be aware that the badger cull is underway. Over the six weeks they aim to kill 1,000-2,000 animals. Lives wasted. It’s a disgrace and with it being something that you are against, you want to show your support and help fight against it. For me, I’ve watched, observed and filmed badgers locally to me for quite a few years. I know how superb they are and it makes me very upset that they’re the victims despite all science against it. So what can you do? For starters, on the ground in the cull zones, badgers desperately need your help. Either patrolling, sett sitting, sabbing, helping at the camps or so on. This is the sort of action that saves lives and shows that we aren’t going anywhere. If you can’t make it to the cull zones to volunteer there, you can still support the work they do by donating, tweeting or so on. 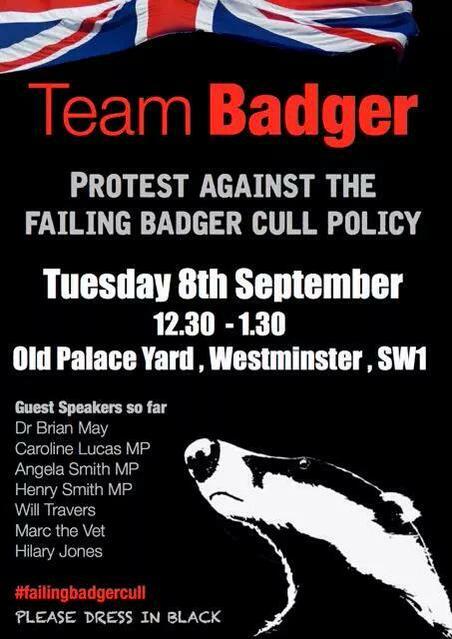 Another opportunity to show how much we care and show how this cull is absolutely ludicrous is by joining Team Badger in London tomorrow. Details below. Pingback: National Badger Day | Georgia's Wildlife Watch.